Volgend jaar is het 20 jaar geleden sinds het debuutalbum van HammerFall , ‘Glory To The Brave’, in 1997 uitgebracht werd. Sindsdien is de band een heus begrip binnen de metal wereld. Op 4 november was het tijd voor deze Zweedse band om een nieuwe wapenfeit aan hun discografie toe te voegen, het 10de studio album van de band, ‘Built To Last’ (de review lees je hier). Een goed moment dus om met bassist Fredrik Larsson te spreken over o.a. dit nieuwe HammerFall album en hun aankomende Europese tour. Q: Hi, thanks for taking the time to do this interview. How are you? Fredrik: I'm fine thanks! Just one week to release, so a bit nervous but I'm really looking forward to it. 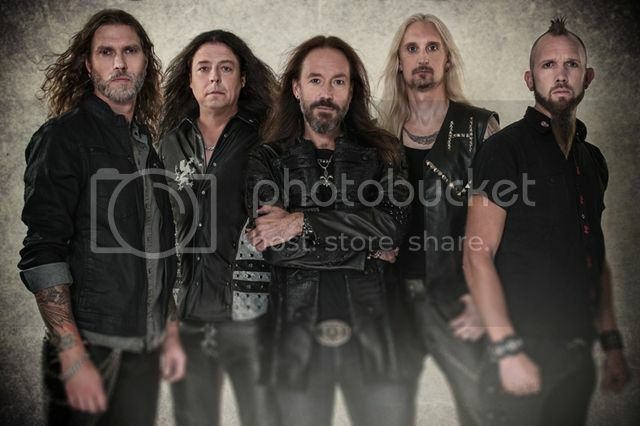 Q: HammerFall’s new record ‘Built To Last’ is about to come out on November the 4th. How are you living up to its release? Fredrik: Well, there's really not much we can do. We recorded the album and have done everything in our hands to make it as good as we possibly can and now it's soon time for our fans to judge it. Q: Can you tell us more about what ‘Built To Last’ is all about and what people can expect to hear on it? Fredrik: I think the title says a lot. When we recorded our first album in -96 nobody thought we would even make a second album to follow up what they thought was something of a joke. We proved them wrong and now, almost 20 years later with our 10th studio album, we are definitely Built to Last. Q: What would you say influenced the band during the writing process for this record? Fredrik: I know that Oscar needs to refill with more music before he can get really creative. He listens to a lot of music and gets inspired to write his own thing. And Joacim gets his inspiration from pretty much everything that happens around him. Books, movies, news and of course music. Q: Where there any particular challenges that you had to face this time around while creating and recording this album, maybe compared to creating/recording processes for previous albums? Fredrik: I think that we had more pressure when we entered the studio to record ‘r(Evolution)’ because of the break in 2013, and we felt that we had to achieve something very, very good just to pass. But this time we had a lot of confidence, even though I think especially Oscar had it a lot harder to get the songs out of his system. For me it's hard to say, I get some rough demos and try to do my thing so the process for me was really similar. Q: What would you say is the biggest difference between ‘Built To Last’ and previous HammerFall records like for example ‘(r)Evolution’ or ‘Infected’. Fredrik: ‘Built to Last’ for me is really close related to ‘r(Evolution)’ since they were recorded pretty much the same way and with the same people. Except that we had David on drums on this album. And they definitely sound more like each other than for example ‘Infected’, which sounded a bit more American. ‘Built to Last’ is for me a more diverse album and the pace might be a bit faster, it will fit really well in the live set. Q: If you had to pick two songs of ‘Built To Last’ that people should definitely not miss and should listen to, which two would you say? Could you tell us a bit more about those songs as well? Fredrik: Ok, first I would say “Second to None”, which is a slower vocal driven song with a really mighty chorus. 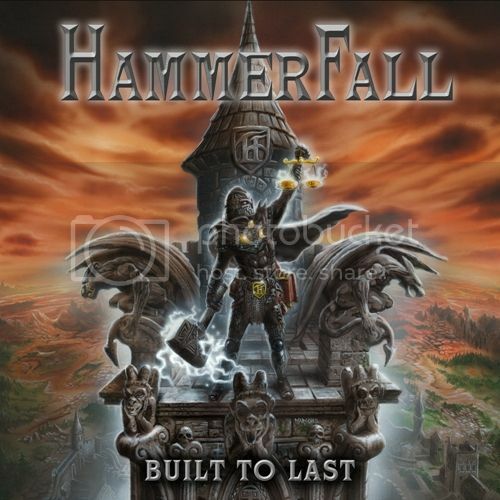 Really different from the others but absolutely HammerFall all the way. And then I choose “Stormbreaker”. A faster song with some interesting tempo changes. Joacim sings fantastic on this one. Q: You will be kicking off the new year with a new European tour. What are your expectations for this tour? Fredrik: Since I wasn't on the last European tour, I was on parental leave, I really look forward to be out on the road again. To be on stage, see the reactions from the fans and get the feedback. I like to be in the studio but it's definitely on stage that I belong. I love it! Q: You’ll also be playing a show in the Netherlands and Belgium. What can fans expect from those shows? Fredrik: We're in the middle of planning everything for the upcoming tour so I really don't know all the details yet, but I can assure you that HammerFall will always give the audience 100%, no matter what! Q: 2016 marks 23 years of HammerFall. How do you look back on all these years? And what do you still hope to achieve in the future? Fredrik: We have talked a bit about this and we want people to know that we will always struggle to take the band to the next level. That's part of us changing label for instance. We want everybody that work for us to have the same goal as us. And I hope that this album will be welcomed and that we continue to grow so that we can play even more and bigger shows! Q: Besides releasing the record and touring, what are the plans for Hammerfall for the rest of 2016 and 2017? Fredrik: We have some planning and rehearsing to do this year and then it's off on the European tour in mid January. Then follows a North America tour and a South America tour after that. Then it's festival summer so we really have a lot of shows coming up! And I'm sure we're going to do some more shows next fall as well. Q: And my last question, do you have any message for your fans and the readers of Metalkrant? Fredrik: I really hope that you will like our new album and that I will see you on some of our upcoming shows! Bring some friends and make this metal party even bigger! Op maandag 16 januari 2017 zal HammerFall te zien zijn in TivoliVredenburg in Utrecht. Kijk voor tickets op www.tivolivredenburg.nl.